At the intermission of Long Beach Opera's An American Soldier's Tale/ A Fiddler's Tale, the woman next to me turned and asked in a genuinely confused voice, "is this an opera? I thought I was going to an opera." Well, yes and no. LBO has done a number of solid productions that involved a considerable amount of speaking. Stewart Copeland's The Tell-Tale Heart and Peter Lieberson's King Gesar are examples of productions from last year that leaned strongly towards narration. It's an intriguing take on music's relationship to the voice, and a sign of LBO's willingness to explore those boundaries. LBO's Stravinsky-inspired production was a double header. 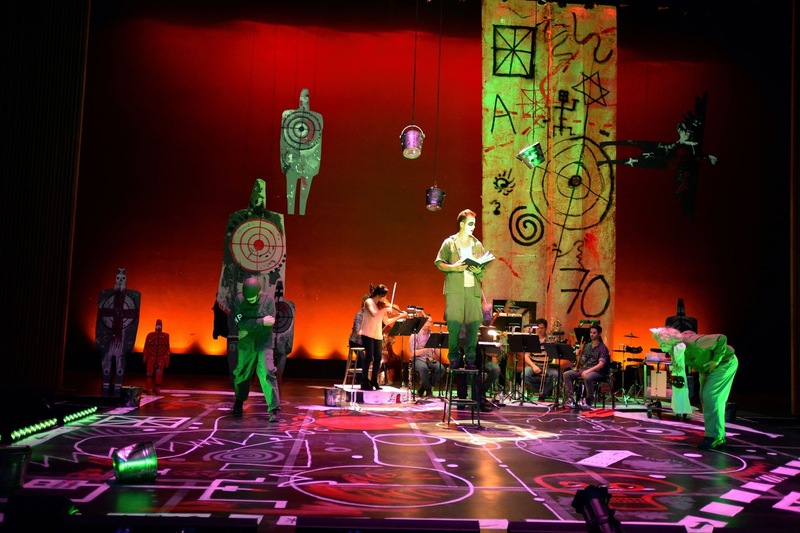 Histoire du Soldat became An American Soldier's Tale with Kurt Vonnegut's updated libretto, and it was paired with Wynton Marsalis and Stanley Crouch's A Fiddler's Tale, written for the same instrumentation. Both pieces focused on different aspects of C.F. Ramuz's original libretto. Vonnegut connected more to the war reference, while Marsalis and Crouch responded to the musician's deal with the devil for economic gain. Hearing Stravinsky's score is always a pleasure, and that was no different with Kurt Vonnegut's new text. Commissioned by New York Philomusica in 1996, Vonnegut's libretto was based on the death of Eddie Slovik during WWII. I was reminded a bit of David Little's Solider Song, which I saw at Pace University last year (directed by The Industry's Yuval Sharon). Kevin Reich, Tony Abatemarco, and Mark Bringelson gave the piece an energetic theatrical performance, adorned with Commedia dell'arte makeup and various stages of military undress. This served the piece quite well, except for a few parts. There were several instrumental sections (in both pieces) during which the actors' dancing became distracting to a dedicated listener. In one section, the sound of actors rolling on the ground covered up some of the intriguingly nuanced spaces and polyrhythms in the music. How important that is depends on how your organize your priorities as an audience member. Marsalis and Crouch's A Fiddler's Tale was about a violinist who made a dubious deal with a devilish producer for acclaim and fortune. Hearing such a story from such a commercially successful musician as Marsalis may seem suspect, but it's actually quite appropriate. 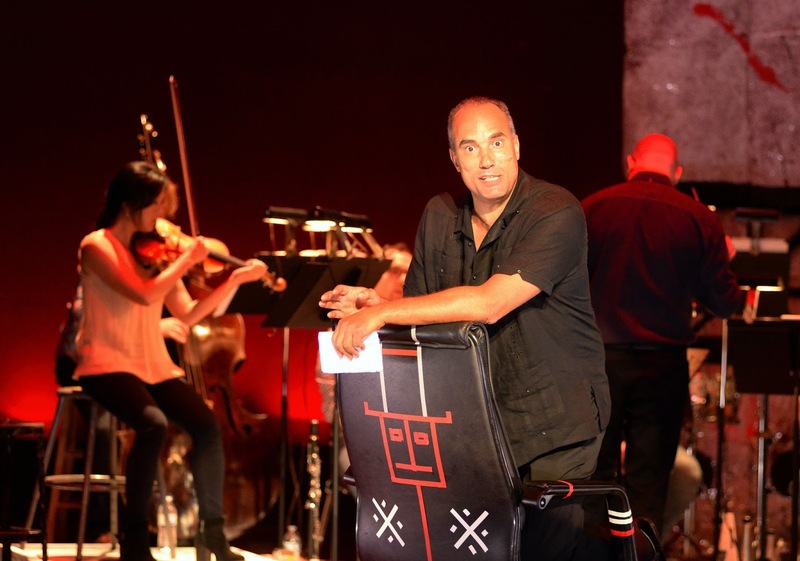 Extremely text heavy, much of it felt like an augmented monologue for Roger Guenveur Smith. However, his rich performance drove the piece forward, and never felt unduly stilted. The music that made up the last third of the piece was quite amazing, though the musical buildup to it was maybe a bit extended. The overall piece felt like an updated response to Stravinsky's score, accentuating the elements that made the original so intriguing, while adding a New Orleans-inflected flair. The musicians did a great job with both pieces. Alyssa Park was the featured violinist for both pieces. Conducted by Kristof Van Grysperre, she gave a particularly fine performance during the Marsalis, lending the part great energy and expressivity. The score was cleverly written, in that it didn't request a classical ensemble to swing harder than they might otherwise. Instead, it's Dixie syncopation was synthesized through an emulation of Stravinsky's odd-time styling. I had never been to Long Beach's Center Theater, and I enjoyed the space. Danila Korogodsky's set was the environment in which both pieces lived, with the musicians behind onstage. 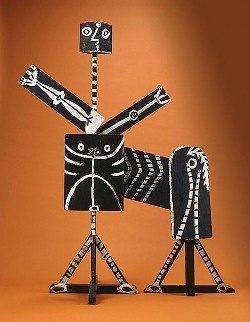 The design elements reminded me of Basquiat, Picasso's Centaur, or maybe the cover to Unkle's Psyence Fiction. Knowing the original story of Ramuz's text might have given me an added layer of appreciation - one that my seat neighbor might not have had the point of reference for. However, such musicological stratigraphy is exactly what this production is about. In my own work, I work to build multiple levels of engagements and points of entry, and this production did just that. Even the dancing that I found so distracting was part of reaching towards that noble goal, so it all works out.